Former NHRA World Champion Jerry Ruth will make a very special guest appearance at the 45th O’Reilly Auto Parts Boise Roadster Show. Set for March 10-12, the “King” was one of the all-time winning professional drivers in northwest Top Fuel and Funny Car competition. Ruth appeared and won countless times at a number of Firebird major events. Most noteworthy was 1971. The Division 6 World Championship Series event saw him earn titles in AA/Fuel Dragster and AA/Funny Car, an unprecedented double up feat. He would go onto duplicate this remarkable accomplishment three more times in his career. As an added treat, Jerry will be bringing his fully restored 1969-71 original Top Fuel car built by Don Long to the Boise show. Another highlight for “the King” was winning the 1973 NHRA World Title in Top Fuel. He also swept 8 consecutive Division 6 season-end point’s championships in Top Fuel and three more titles in Funny Car. In 2004, Ruth was nominated and inducted into the Northwest Division Hall of Fame. 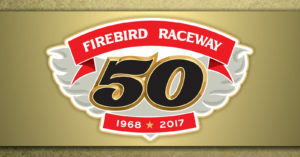 We’re very excited “the King” will appear in celebration of Firebird’s 50th year. Jerry competed at the inaugural Nightfire 500 in 1972 and the first Ignitor Opener in 1971. Ruth won titles at both the 1972 and 1974 Ignitor events. Ruth will share stories, sign autographs and visit with fans of all ages at this year’s show. Amazingly enough, Jerry first appeared at the Boise car show (with his Mustang Funny Car) way back in 1975. Photo (above) taken at the 1997 Ignitor of Ruth, along with the New Crew. Image provided by Rich Carlson.